Wealth. Power. Glory. Revenge. When it feels like the world is against you, can anyone be trusted? April 1940. Norway has fallen under the Nazi blitzkrieg. Only a small British force stands between Hitler’s SS and the ultimate prize… but a hidden enemy has other plans in motion, plans that threaten to derail both sides’ plans. Lieutenant Harry King is in trouble again. Haunted by his past and consumed by alcohol, he stands to lose the only thing he has left – his rank. When he is saved from his fate by a mysterious officer and sent on a seemingly simple errand, things start to go horribly wrong and King soon becomes the only person who can stop his new enemies. Dragged into a hair-raising world of conspiracy and betrayal, King must choose between his duty, love and revenge. In a heart-pounding race across the frozen tundra, mountains and fjords, can he survive against the odds and prevent disaster? Can he recover a mysterious missing cargo that holds the key to success? Will he uncover the truth and unmask the traitor at the heart of his world? Kingmaker is a gripping adventure based around the forgotten history of the early Second World War, and will appeal to all readers of action thrillers, spy stories, crime and mysteries as well as military and historical novels. 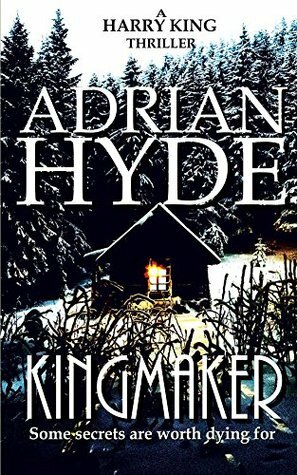 This novel is seriously impressive, set during the second World War, it is a mix of factual events and the wonderful imagination of author Adrian Hyde. The majority of the story takes place in Norway after 1940 and the start of the German invasion. There is far more going on than first meets the eye with the assassination of a prominent Norwegian Banker and an English Lieutenant on the brink of being kicked out of the British army, being transferred to a covert unit under another officer’s command. What an absolutely belting story which has been seamlessly worked together to give an action packed riveting read. Lieutenant Harry King is quite a formidable character which I liked straight away, I do tend to like the good guys which have a troubled past and too hard to live with present. It makes them better to root after to succeed. He is a bit of a swoon after guy too which I am sure will get a following in future novels. Of course back in the 1940’s women’s involvement in front line war matters was extremely rare so the inclusion of Anja, a Norwegian interpreter, was very much a welcome addition to the story and gave the element of a little romance amongst the ranks. This is a novel of traitors, greed and power by people in positions to take advantage of situations for their own advancement, with no respect for loss of human life. The contrasts of the beautiful but unforgiving winter scenes in the Norwegian mountains were breath taking, with the vivid descriptions by Adrian Hyde enhancing every moment so that they will stay with me for a very long time. A novel that will make perfect reading for historians of the second World War, anyone loving an adventure story and even a little romance. An all round brilliant book, which I thoroughly enjoyed every minute. I wish to thank Adrian Hyde for a copy of this novel which I have chosen to review.